Despite the steep increase in the price of green and pink tourmaline in the last few years, tourmaline remains one of the best gems to buy. Green tourmaline rings have a refreshing and lively appeal, the human mind links the color green to nature and this has a soothing effect. The RG233GT tourmaline ring is designed to be comfortable when worn, good metal weight combines with a researched design to ensure that your ring will give many long years of wearing pleasure. Green goes well with most dress styles, you can wear this ring to work every day or even treat it as a leisure wear accessory and slip it on your finger for that shopping trip. Tourmaline is a sturdy gem, the design structure of this ring provides features that further enhance the durability of the jewel. Notice how the entire gem is bordered with metal, the bezel setting is considered to be the most reliable when it comes to fine jewelry. The metal weight of the ring will make sure that the jewel does not bend or deform easily. We have left prongs out of this design, prongs tend to stick in pockets and other fabric - this causes them to gradually open up and loosen the gemstone. Tourmaline is found in a range of colors and within these colors, are a stunning array of hues and shades. The gemstone gets its name from a Sri Lankan word ‘turmali’ which means, mixed colors. The ancient belief in Sri Lanka was that, tourmaline passed through a rainbow during its journey to earth. This caused the gemstone to be bestowed with the colors of the rainbow. In some rare cases, tourmaline crystals distinctly show more than one color in the same color – these are referred to as bi-color or tri-color tourmaline. When it comes to fine jewelry, it is pink and green tourmaline that draw maximum interest. One variety of tourmaline shows a high degree of red and some shades of pink, this gem is commercially referred to as rubelite. Don’t confuse rubelite with ruby, both are beautiful and completely different gemstones. If you choose to order this tourmaline ring you can specify, pink, green or rubelite tourmaline. The price remains the same for all these gems. Kaisilver jewelry is crafted in gold and sterling silver, the same quality standards are applied to gold and silver jewels. You can order a gold or silver tourmaline gemstone ring, choose from pink or green tourmaline. The gold ring is available as a 14k or 18k tourmaline ring and you can select, white, yellow or rose gold. The quality of workmanship for the silver tourmaline ring, matches that provided for the gold ring. Our gem experts carefully select and pick each gem that is set, quality is once again uniformly maintained for the gold or 925 silver gemstone ring. The ring has a 6mm square gemstone in the center, you can select your choice of gem. The ring has a weight of around 8 to 10 grams, larger sizes might need more weight. The head height of the ring is around 9mm, the portion behind the finger is about 3mm. 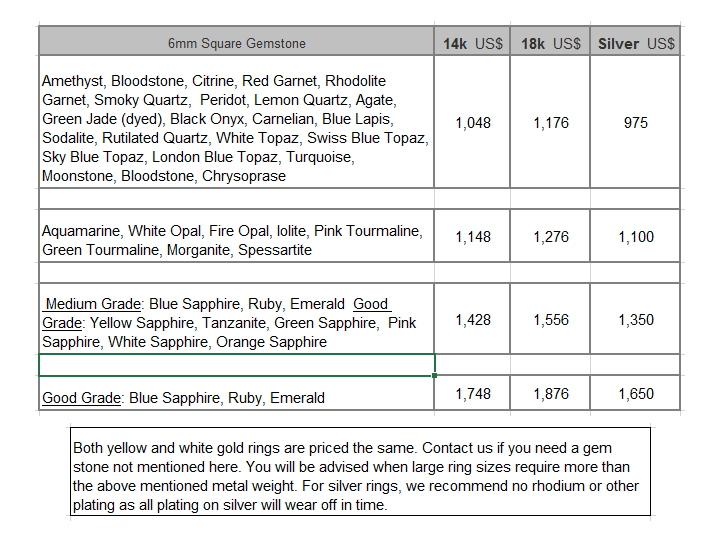 Since each gold or silver tourmaline ring is custom made, all ring sizes are available. For the tourmaline ring, we offer options for green and pink tourmaline gemstones. We can craft the gold or silver tourmaline ring, with a square, round or oval gemstone. The gold and 925 sterling silver gemstone rings have the same quality standards. Gold rings can be ordered as 14k or 18k white, yellow or pink gold tourmaline rings. A price quote can be provided on request if, you prefer to buy a 10k gold ring. All design modification requests can be accommodated, for the RG233GT ring. We can also craft tourmaline gemstone rings based on your own design concept. How To Buy: Most online jewelry providers expect buyers to rush and make a purchase even when, the website provides nothing more than a brief description of weights and sizes. This is not how we at Kaisilver wish to craft and sell high end custom made jewelry. We encourage you to discuss your requirements with our support team at sales@kaisilver.com Since all jewelry is completely custom made, it is important that your jewel incorporates all that you expect it to. Our team is composed of experts in every aspect of gems and jewelry including, gem cutting, designing, jewelry production etc. Get all your questions answered and move to the purchase step only when, you know exactly what you will be getting. The time required for production is around 4-6 weeks from the day, that you confirm your custom jewelry order with payment. We recommend Paypal as the mode of payment especially for, first time buyers. We also accept payment through Western Union and Direct Bank Transfer. You can let us know which mode of payment you prefer, we will provide details for the same. Your parcel will ship through FEDEX with a web tracking service, you will receive the tracking number the moment the parcel ships. A shipping fee of 35 U.S$ will generally cover shipping expenses to most destinations. Our team will inform you if we can manage to absorb the shipping charges for your order, you will be informed before payment is made. The Kaisilver sapphire ring collection, researched designs, choice of gold and silver and we can even custom make your sapphire ring with the gemstone of your choice. You can choose white, yellow, green, orange, blue or pink sapphire gems for your rings. It is possible to combine different sapphire colors in the same ring ... more. Jade is adored for its beauty and almost mystical appeal. 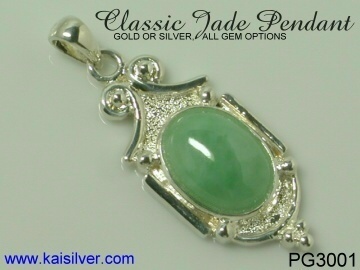 Kaisilver offers jade rings and pendants with natural jadeite jade from Burma (Myanmar). By sourcing moderately priced jadeite right at the mining locations, we are able to provide untreated jade jewelry at a very reasonable price. Dyed jade is also available on request ... more. 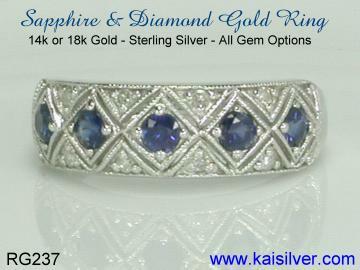 Kaisilver: As the leading online made to order jewelry provider, we craft all types of jewelry with your designs or ours. We prove our strong commitment to quality by maintaining the same quality standards, for silver and gold jewelry. Preferential access to gems from almost every gem mining location and direct connections to the largest gem manufacturing houses, allows us to place absolutely no limitation on your choice of gemstones. Our support experts at sales@kaisilver.com will be glad to help you with any questions or requirements that you might have.